An explosive day of violence ended Wednesday when a man believed to have shot five people in a cafe near the University District and a woman in a downtown parking lot shot himself in the head as police closed in. “We strongly believe that this is the person that committed the homicides” – Assistant Police Chief Jim Pugel told reporters after the dramatic face-off in West Seattle. 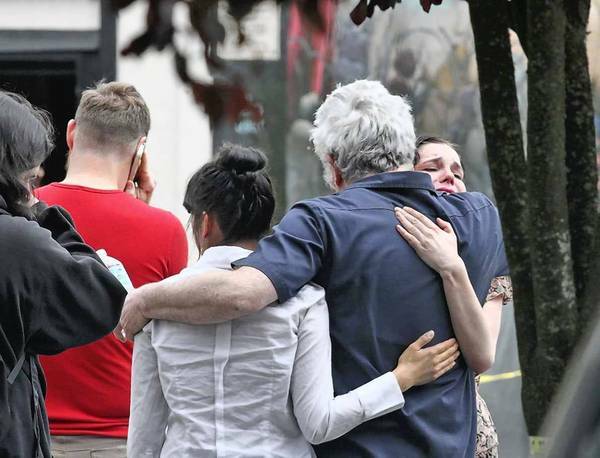 The shootings left six people dead, including the suspect, and one critically wounded. Among the four people killed at Cafe Racer, near the University of Washington, were two men who were members of the band God’s Favorite Beefcake, which had performed over the weekend at the city’s Folklife Festival, witnesses told KIRO television. One of the pair was also a sword swallower and fire breather who often performed in local burlesque shows, the station said. Police initially were not certain whether the two incidents were related. The shootings had occurred within half an hour of each other but several miles apart. Surveillance photos from the 11 a.m. shootings at the cafe showed a man with dark hair, a beard and a pale blue jacket. In the second incident, which happened about 11:30 a.m., police said a man shot a woman and drove off in a black sport utility vehicle. It was found abandoned several miles away in West Seattle, with a gun on the seat. While a massive dragnet was underway in the neighborhood near the cafe, plainclothes detectives began combing the area where the black SUV was found – Pugel said. An officer in West Seattle saw a man who appeared to resemble the one in the cafe surveillance photos – Pugel said. The shootings shocked the northwestern US city that has now seen as many murders this year as it did in the whole of 2011. The suspect, identified by the Seattle Times as 40-year-old Ian Stawicki, is believed to have entered Cafe Racer Espresso, near the University of Washington, at around 11am (18.00 GMT), where he shot five people with a pistol, two of whom died at the scene. Half-an-hour later, Stawicki is believed to have shot dead a woman in downtown Seattle before fleeing in a black Mercedes-Benz SUV. An officer spotted the suspect a few hours later a mile-and-a-half away from the abandoned vehicle. When patrol cars approached Stawicki he put a gun to his head and fired one round, Deputy Police Chief Nick Metz said, according to the Seattle Times. “The man detectives believe to be the lone suspect in four murders in two locations shot himself in the head when approached by @SeattlePD” – read a tweet from the Seattle police department earlier on Wednesday. He was taken alive to a Seattle clinic where he and two more of his victims later died. “We’ve had two tragic shootings today that have shaken this city. And it follows on the heels of multiple tragic episodes of gun violence that have occurred throughout the city” – Seattle mayor Mike McGinn told reporters. The motive for the shootings was not clear, but the suspect’s brother told the Seattle Times he was mentally ill.
“It’s no surprise to me this happened. We could see this coming. Nothing good is going to come with that much anger inside of you” – Andrew Stawicki said. As officers closed in during a widespread manhunt late Wednesday afternoon, the suspect put a gun to his head and pulled the trigger. He died at a local hospital – a hospital spokeswoman said. Police did not publicly name the suspect in Wednesday’s shootings, but the Seattle Times identified him as Ian Lee Stawicki, 40, of Seattle, citing unidentified law enforcement sources. Andrew Stawicki (29) of Ellensburg, told the Times he recognized a photo shown on TV newscasts of the alleged gunman as his brother Ian. Andrew Stawicki said Ian Stawicki was mentally ill. This entry was posted on Thursday, May 31st, 2012 at 7:44 am	and is filed under Tragedy. You can follow any responses to this entry through the RSS 2.0 feed. You can skip to the end and leave a response. Pinging is currently not allowed.